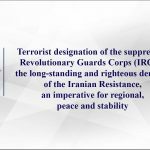 Maryam Rajavi, the President-elect of the National Council of Resistance of Iran (NCRI), released a statement after the designation of the IRGC as a Foreign Terrorist Organization by the United States. On April 8, 2019, the United States added the Islamic Revolutionary Guards Corps (IRGC) to its list of Foreign Terrorist Organizations (FTOs). The designation marks another significant step by the United in ending the longstanding policy of appeasement toward the mullahs. 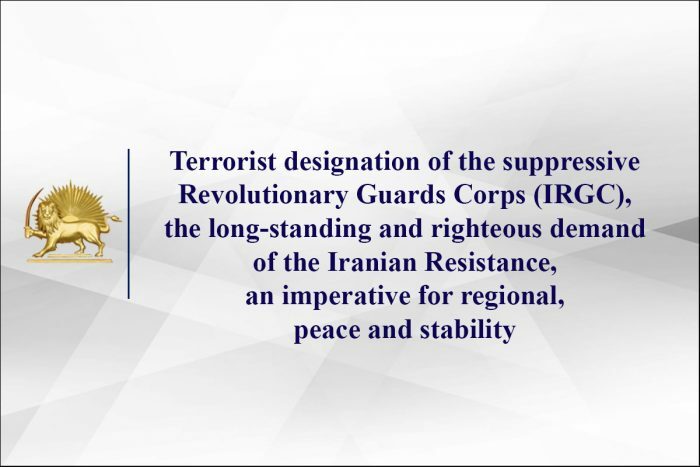 Following the announcement on Monday, Mrs. Maryam Rajavi, President-elect of the National Council of Resistance of Iran (NCRI), issued a statement on the IRGC’s terrorist designation, calling it an imperative for Middle Eastern security, peace, and stability, and an urgent and necessary step to end war and terrorism throughout the region and the world. In her statement, Mrs. Rajavi pointed out that the NCRI and the Iranian Resistance has called for years to have the suppressive Revolutionary Guards designated as an FTO. The MEK has advocated for the inclusion of the IRGC on the FTO list for many years. “This action, which was long overdue, should now be completed by designating the Iranian regime’s Ministry of Intelligence and Security (MOIS),” she added. velayat-e faqih regime (absolute clerical rule) through its repressive actions within Iran. The Revolutionary Guards are responsible for suppressing all forms of protest and political dissent. The IRGC also controls the regime’s aggression outside of Iran, including wars, terrorist actions, and its nuclear and missile projects. In addition, the IRGC controls at least 50 percent of Iran’s economy. Mrs. Rajavi stressed that the IRGC has been responsible for bloodshed in wars in Iraq, Syria. Lebanon, Yemen, and Afghanistan due to the policy of appeasement toward the mullahs. Many of these deaths could have been prevented if the Revolutionary Guards had been designated as a terrorist organization earlier. Mrs. Rajavi urged the European Union to follow the United States’ lead and designate the IRGC as a terrorist entity. She stressed that the IRGC poses a threat to both the Iranian people and peace and security in the region. She also noted that the ultimate solution to dealing with the Iranian regime is to allow the Iranian people and its Resistance movement to overthrow its oppressive caliphate. Recognize the right of the Iranian people and the Iranian Resistance to overthrow the ruling clerical regime and establish a free Iran. Place the Ministry of Intelligence and Security (MOIS) and other organizations who export terrorism and fundamentalism on the U.S. State Department’s FTO list and the E.U.’s Terror Watch list. Expel all agents of the MOIS and the terrorist Quds Force from the United States and Europe. Refer the dossier on the Iranian regime’s human rights violations and the massacre of political prisoners to the United Nations Security Council and the International Court of Justice. Expel the Iranian regime from the U.N. and recognize the Iranian Resistance as the true representative of the Iranian people.